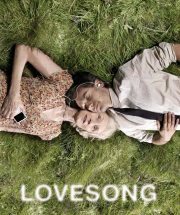 A co-production with Frantic Assembly, Lovesong follows one British couple who we see at the beginning of their life together as they emigrate to the US and also much later on in their old age. But rather than opting for a straight narrative about this marriage, Morgan flits between past and present: memories are revisited and stories recollected by Billy and Maggie of their earlier lives as William and Margaret, the joys of early marriage, the struggles of trying to conceive and the disillusionments that creeps into everyday life and how they have all accumulated and translated into the relationship that they now have. Everything overlaps with great fluidity, Frantic Assembly’s customary movement is present thanks to directors Scott Graham and Steven Hoggett, and so scenes bleed into each other beautifully, entrances are made in the most imaginative ways and there’s a beautiful physicality to the choreography that is sprinkled throughout the show. Words can’t really express the sheer beauty of the images that are created: the chemistry between the couples is nicely enhanced by their dances together but there’s something that is just heartbreakingly beautiful that emerges when time blurs and the older selves interact with the younger. Truth be told, I started crying from about 10 minutes in, but seeing Siân Phillips’ Maggie tenderly dancing with Edward Bennett’s younger version of her husband after a beautifully poignant moment with some shoes was the moment that made me think I was really going to lose it and start full on sobbing! Phillips is sensational throughout, emotionally fearless and perfectly paired with Sam Cox’s Billy, forever searching for the right thing to do and it is their relationship that forms the most moving, their fight that pierces the soul. Leanne Rowe and Ed Bennett both do well at tracing the journey from idealism to realism and by the time they all come together for the stunning final montage, it is hard to imagine even the flintiest soul not being just a little bit affected. Undoubtedly there’s a degree of emotional manipulation going on here, often on a cinematic scale. Carolyn Downing’s score is all sweeping, evocative sounds and Ian William Galloway’s video design is full of artfully elegant imagery. It all works toward serving the same purpose though, to reinforce the message of the ebb and flow of love and relationships and of the desperate sadness in human fragility. Consequently, Lovesong won’t be to everyone’s taste: the overwhelming build of atmosphere leaves no escape so if you’re not feeling it from the off then that is unlikely to change and some may find it overly vague. But it really does feel that the intention here has never been to create something precise and defined; rather it is a play to be felt deeply, to let yourself be open to and to let tug unashamedly at your heartstrings. Simply beautiful. Booking until 4th February and then continuing to tour to Citizens Theatre Glasgow and Sherman Cymru Cardiff. seeing Siân Phillips’ Maggie tenderly dancing with Edward Bennett’s younger version of her husband after a beautifully poignant moment with some shoes was the moment that made me think I was really going to lose it and start full on sobbing! Yes! This exactly! My god but it was incredible.